“I turned the business card over in my hands. On the back, there was a handwritten note. Cassandra, it said, PLEASE CALL. That was it. My name, and the directive to call, in capital letters. No explanation. No Nothing. Below those words, someone else has scribbled a second set of instructions in small, sharp letters- barely readable. 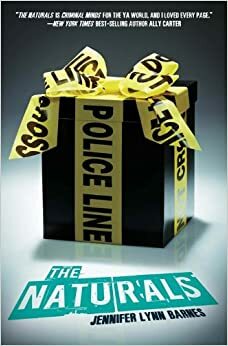 I traced my finger over the letters.” The Naturals, by Jennifer Lynn Barnes, intrigued me with the author’s exceptional imagination and creativity. It all began when Briggs, an FBI agent, discovered Cassie, a teenager with a natural ability of reading people’s emotions, and landed her a spot in an elite FBI program for teens with innate crime-solving abilities. At first she thought that she’d be solving cold cases, ones that were from a while ago but were never solved, but after a killer began to murder people who have the same job and resemble her mother, who was assassinated a few years ago, things start to develop into something interesting. Gifts are left for Cassie from the killer. One was of her murdered mom’s hair and another was a picture of a fifteen year old girl, Genevieve. The stalker was keeping Genevieve captive and planning to kill her unless he could take Cassie instead. She gradually convinces Briggs and Agent Locke, another FBI agent, to let her in on this case. All the while, Cassie meets Michael, Dean, Lia and Sloane, who also share natural powers such as exceptional math abilities, and being capable of reading one’s emotions or even knowing when someone is lying! Everyone in the classified program for unique, natural abilities, has to use their unbelievable talents to survive and crack this case. Will they find out who it is and why the killer is obsessed with Cassie’s mother? Jennifer Lynn Barnes’s novel was very exciting and I always wanted to know what was going to happen next. Overall, my favorite part of the novel was the plot. Barnes’s creativity was brilliant and I would never have guessed who the killer was. I could tell that she put an extravagant amount of effort into the storyline especially because the ending was so surprising and original. I particularly loved how the murderer was revealed. Jennifer Lynn Barnes makes it sound like one person committed the crime, then she switches, and makes it sound like someone else did it. That writing style makes the story more complex, secretive, and even confuses you so you don’t have any idea who the killer is. There are several particularly interesting characters like Cassie, Dean and Michael. The three of them had a love triangle which was intense and fascinating. Lia and Sloane were the other teenagers who were in the Natural program. Lia was sassy and created awkward situations between Dean, Michael and Cassie and that was part of what made it so engrossing to read. Another part that made the book so interesting was the setting. Hanging on all the walls in the house the naturals lived in were pictures of murderers which made it very eerie. The settings of the crime scene was descriptive and scary, especially when Cassie and her other talented friends arrived at the bar with multiple clues and the theater where there was an exact replica of Cassie’s mom’s murder. Overall, I think that Barnes has an interesting and intricate writing style. Jennifer induced the Killer to sound mysterious and even scary. She also developed suspense, mainly when she revealed who the murderer was. She put many clues in her book, but what I admired the most about them was how puzzling they were and I enjoyed trying to figure them out. I loved how she put several parts in her novel from the killer’s point of view because that also made it thrilling to read. All in all, I would definitely recommend this book to anyone who loves a suspenseful mystery book and I can’t wait to read the next one!